Machine Gun Kelly isn't too impressed with Eminem's latest diss track directed at him. The rapper took to Instagram to fire back at last week's "Kill Shot," claiming that the song was a miss. 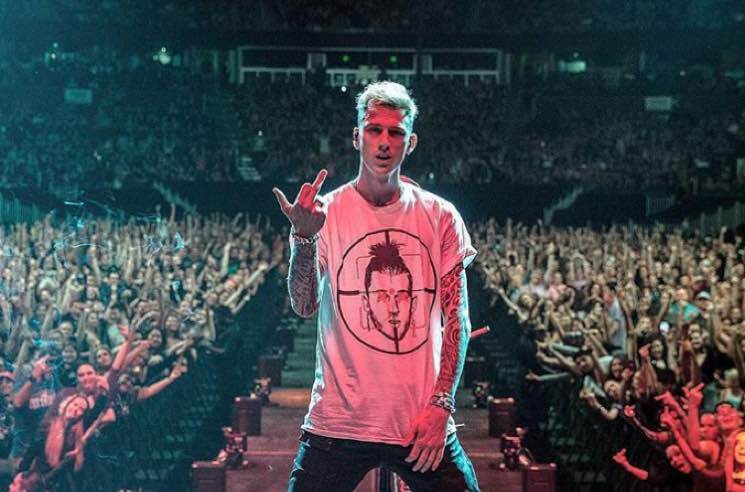 Posting photos of himself flashing the middle finger against a backdrop of Fall Out Boy fans, MGK declared that "he missed," then followed that up with the hashtags #legshot, #rapdevilstillnumberone and #letstalkaboutit. He also fired back at Em on Twitter with some choice emojis, including a basketball player dunking on a toilet and a little dude throwing out trash. Machine Gun Kelly and Eminem have been going after each other since Em dissed MGK on Kamikaze track "Not Alike." Machine Gun Kelly responded with "Rap Devil," but Eminem countered once again with "Kill Shot." MGK has yet to deliver another diss in song form, though he did announce that he'll be releasing a new EP titled Binge on September 21. It's unclear if it will feature his previous Eminem diss track or new ones or none at all. In other Eminem beef news, the rapper recently admitted that his homophobic slur against Tyler, the Creator on Kamikaze went "too far."